With women in leadership, more time for students to study and even a Starbucks, the Texas A&M University Corps of Cadets is a kinder and gentler version of its former self. COLLEGE STATION — Life is never easy for members of the Texas A&M University Corps of Cadets, an ROTC-like military program that dates to the 1800s. Students wake up before sunrise, endure tough morning conditioning drills and wear stuffy military style uniforms to class in the hot September sun. But starting this semester, cadets get one small luxury: Fancy coffee. During a recent renovation, a two-story Starbucks was added to one of the Corps' barracks-like dorms. Now, in between 6 a.m. roll call and 9 a.m. class, freshmen with buzz cuts can relax in comfy chairs, sip iced coffee and listen to the soothing sounds of Spanish guitar. The perk is a small part of a larger effort to move the Corps beyond its hell-raising, hidebound reputation. 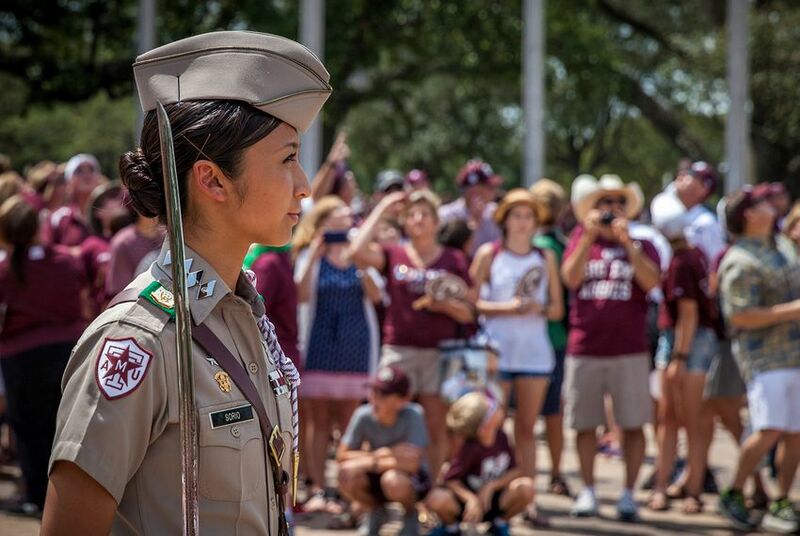 The Corps of Cadets still clings proudly to traditions — the university calls the group the "keepers of the Aggie spirit" — but it's trying to evolve with an emphasis on academics, diversity and leadership. Upperclassmen are now encouraged to scream less at the freshmen. More time is devoted to school and sleep. And for two straight years, a woman has been selected as commander, the top student leadership post in an organization that was all male until the 1970s. In the end, it's a kinder, gentler Corps that's devoted to creating leaders in the military and business worlds. "The stuff we thought was so much fun [decades ago] probably doesn't fit into society right now," said A&M System Chancellor John Sharp, who joined the Corps as an undergraduate in the late 1960s. The changes appear to be working. After decades of stagnation, enrollment is up. And last semester, students in the Corps posted an average GPA of 3.06 — the highest in Corps history. School officials say the changes may have saved the Corps from extinction, even if they are jarring to many "old Ags." "I couldn't imagine anyone wanting to work at a Starbucks in the quad in my day — for fear of being dragged into a mud hole," Sharp said. The man behind most of those changes is Brigadier General Joe Ramirez, who took over as commandant of the Corps in 2010. He credits the Corps with saving his life. As a listless high school student in Houston's Second Ward, he likely wasn't heading to college. Then, he saw the military-style Aggie Band, all of whose members are cadets, marching through Houston before a football game with Rice University. A saxophone player, he decided he had to join. His time in the Corps led to a career in the Army — military service isn't mandatory for Corps members, but graduates can enter the military as commissioned officers. He returned as commandant 31 years after graduation, and was shocked by what he found. Corps enrollment had stagnated between 1,800 and 1,900 for decades, while total enrollment at A&M had surpassed 50,000. For almost all of A&M's first century, membership in the Corps was mandatory for undergraduates. By 2010, the group was a minor part of a major school. Cadet grades were bad. And to many outsiders, its members were known more for hazing incidents and bizarre behavior during football games than the quality of the military officers it created. "The Corps seemed like a very small element in a very large university," he said. It also seemed stuck in the past. During his first career, Ramirez watched the military evolve and embrace new training and leadership styles. At the Corps, little had changed. He said he was particularly worried about the "screaming, yelling, cursing and demeaning of freshmen, simply because they were freshmen." This happened in the mornings during physical drills, in between classes on campus and in the dorms at night. "Freshmen were here for the upperclassmen's entertainment," he said. "And that concerned me. I looked at this and said, 'In the military, I would never allow my junior leaders to lead soldiers like this.'" Ramirez responded by restructuring his cadets' entire day. Cadets still wake up by 6 a.m. for physical training and morning formation, where they line up, honor the flag and march to eat breakfast in the nearby dining hall. But now at 7:30 a.m., they begin the "academic day," and are mostly left alone to go to class, study or rest. Ramirez has made clear that Corps duties shouldn't conflict with class schedules. From 4:30 p.m. to 7:30 p.m., there are more Corps activities, including dinner. But "evening study time" begins at 7:30 p.m., and Corps members are to be left alone until the next morning. "We had to come in and set some limits and change some mindsets," Ramirez said. "And it wasn't easy." The overhaul was physical and philosophical. A&M's quad, where all the Corps dorms are housed, has been extensively renovated in the last few years. Each dorm has been remodeled, or is being remodeled now. In addition to the new Starbucks, the Corps has opened four leadership learning centers, which are basically mini-libraries where Corps students can study or get tutoring. Meanwhile, the Corps, which is still overwhelmingly male, has stepped up its recruitment of women and minorities. Two years ago, the organization made national news when it selected its first woman student commander, Alyssa Michalke. A small number of alumni opposed the move. But Ramirez said she was selected because she was the best person for the job. Far less news was generated last year when another woman was picked for the same position. Overall recruitment has also improved. When Ramirez was hired, then-A&M President Bowen Loftin set a goal of increasing enrollment from 1,800 to 2,600 by 2020. This year, enrollment is over 2,500 and Ramirez has a new goal: 3,000 cadets by 2020. And the Corps GPA of 3.06 is up from 2.6 in 2010, compared to a university-wide GPA of 2.9. Corps students can feel the change. Junior Sara Wojcak joined the Corps as a freshman from Oklahoma because it offered her a scholarship. She was skeptical, feeling she wouldn't fit in and might quit early in her career. Now, she's in charge of multiple outfits in the Corps, including some that are all male. She has met numerous students from out-of-state and other countries. And she thinks she might join the Air Force when she graduates, something she never thought she'd consider before joining the Corps. "What I have learned here and what I have experienced gave me the mindset toward pursuing this contract," she said. But with all the progress, Ramirez has tried to keep the Corps' most treasured customs intact. Cadets still march through campus and into the stadium before football games in the fall. Freshmen still have buzzed hair, and seniors still wear tall brown boots to class. The Corps is major presence at Aggie events like Midnight Yell Practice before football games and the Muster and Silver Taps ceremonies that honor fallen Aggie students and alumni. Without the Corps, A&M wouldn't be the same, officials say. "I like to tell people that the Corps mixes the Kool-Aid, and then everybody drinks it," Sharp said. Forty-five years ago, Bill Mahomes endured suspicion and scorn as the first black student to graduate from Texas A&M University's Corps of Cadets. Now, he helps run the school. Alyssa Marie Michalke arrived at Texas A&M as a shy and quiet high school standout from Schulenburg, she says. As a junior, she was picked to take charge of the famous and storied Corps of Cadets. Disclosure: Texas A&M and The Texas A&M System have been financial supporters of The Texas Tribune. A complete list of Tribune donors and sponsors can be viewed here.